I always thought of myself as a packrat, but maybe I’m really part squirrel. This realization came today as I weaved through the streets of our town showing three kids where all the “good trees” are, those dumping acorns and beech nuts and colored leaves. Autumn is here. So says the calendar today. So said my mom yesterday. 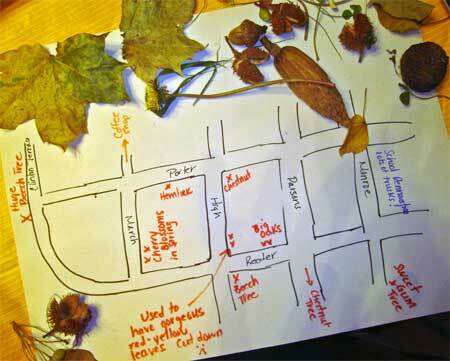 “A fall party,” was my 5-year-old’s answer to celebrating the beginning of fall. Did I really expect a different answer from her? By this morning she’d concocted grand plans of 5 friends, handmade invites, decorations wafting from the ceiling and treats. All to be accomplished in the 4 hours before school. I was thinking more along the lines of collecting colorful leaves for this craft. When her Monday Morning comrade arrived we took to the neighborhood streets, my memory of nuts guiding us to the beechnuts and acorns, hemlock cones and chestnuts. Honestly, it’s amazing we have such variety here in little ol’ Easton. Back at home they ate walnuts and pecans for a snack (like squirrels) and started the craft. 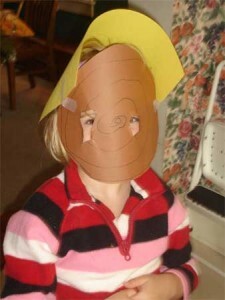 The 5-year-olds loved cutting the spirals and the fall streamers slowly devolved into masks, many of them squirrel masks. Moms know how deviating from the craft is both endearing and infuriating at the same time…after I got out all the supplies for the craft we were supposed to do. But I’ll save that rant for another day. 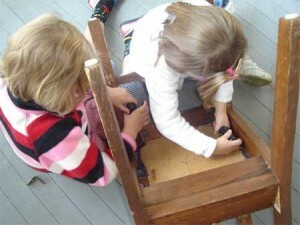 Two 5-year-olds with screwdrivers make short work of my chair. We had some time to kill before going to school, so I gave the two 5-year-olds screwdrivers and told them to take apart a chair that had seen its better days. The only thing the chair had to do with autumn was that it was fall-ing apart. They thought the joke was funny. My plans of celebrating fall with a cute craft ended in me making one fall spiral. I like it. I think they had more fun taking the chair apart (after removing screws, I let them bust it apart with a rubber mallet). 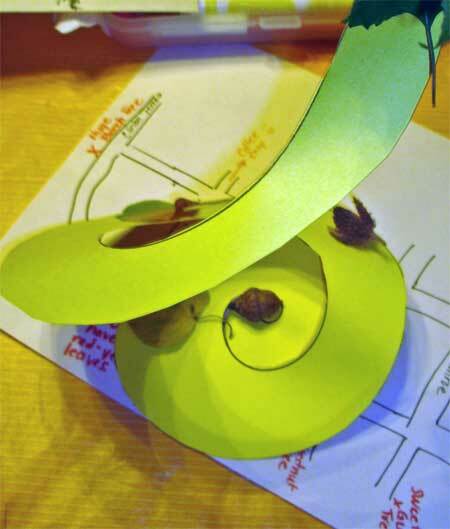 Maybe tomorrow I can convince my kids to glue leaves and nuts to another spiral. Or maybe we’ll just destroy another chair. Come to think of it, the plumber’s coming tomorrow to bust up the basement and make the sump pump hole bigger. Maybe the kids can get in on some sledge hammer action. My (rather pathetic) fall swirly streamer. You have a chance to learn how to make these porcupine quill earrings. 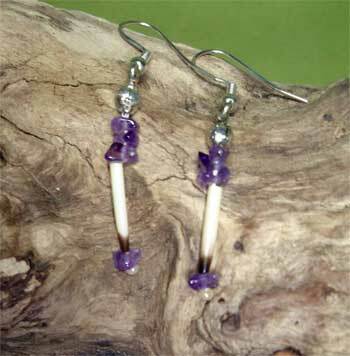 Out of Our Hands will be sponsoring my Porcupine Quill Earring Class on Sunday, June 1 from noon to 2 p.m. The class costs $40 and all supplies are included. You’ll come away from the class with a pair of earrings made with porcupine quills, silver or gold-plated earwires and semi-precious stone chips. Amethyst chips are featured above, but you can also choose from peridot (green), citirine (yellow) or aquamarine (blue). Classes like this give artists and customers a chance to meet and chat. I get a greater understanding of how the rest of world sees my pieces. The results are sometimes very surprising. Customers get a glimpse of the creative process and working with the materials, giving them a greater appreciation for handmade items. So come join the fun. Space is limited, so sign up soon with Out of Our Hands, Emmaus, PA, by contacting OOOH@ptd.net or 610-965-4806. In other news, my Vanilla blog post is featured on The Crafty Crow today. This fun site is tagged “a children’s craft collective.” Created by Cassi of Bella Dia as a way to wrangle interesting kids crafts from all over the Internet, it’s a great resource if you’re stumped on how to keep the wee ones busy today. Making vanilla gets kids involved in cooking at the very beginning of the process and helps them see that all ingredients come from somewhere, not just the store. The vanilla beans went into the bottle almost 6 weeks ago. Today the liquid is the color of strong tea, a beautiful golden brown, but it still has a mightty vodka bite, so it needs a little more time. Visuals on that to come, as my husband just walked out the door with the camera. Check out Crafty Crow’s other posts for the day, too, and have a great Memorial Day weekend!